It was in the late Cretaceous period some 99 – 65 million years ago that the Ankylosaurus roamed the Earth. The Ankylosaurus is the perfect example of the wide diversity that had come to be during the late Cretaceous period as dinosaurs expanded and diversified. This particularly large quadruped is known by many for its large an armored body but there are very many things about the Ankylosaurus aside from just its tough exterior shell that make this dinosaur worth studying for Paleontologists. From its immense size to its survival through to the Cretaceous-Tertiary extinction there are many things to be discovered about this massive vegetarian. The Ankylosaurus is most well known for its huge suit of armor that covered nearly its entire body surface; however, very few people know one of the most impressive facts about this animal – its sheer size. The Ankylosaurus stood at just five and a half feet tall but also measures five feet wide and as much as thirty feet long! When comparing the Ankylosaurus to other land animals it comes out far ahead of the species of today. Amazingly enough the Ankylosaurus was able to sustain itself on a vegetarian diet through to the Cretaceous-Tertiary extinction which means that this mammoth creature was able to find vast quantities of plant life to maintain its huge frame. The Ankylosaurus roamed throughout the Western United States as well as Canada and South America. Some of the Ankylosaurus’ contemporary dinosaurs (although not all living in the same location as Ankylosaurus) include the Tyrannosaurus Rex, the Parasaurolophus, the Triceratops, the Tarbosaurus and Deinonychus. The Ankylosaurus is considered to be a genus of Ankylosaurid dinosaurs which contains only one species – the A. magniventris. The Ankylosaurids are a family of dinosaurs known for their tough armor which formed large plates – almost like turtle shells – that protected the backs of these dinosaurs. The Ankylosaurid dinosaurs are also known for having thick clubs at the end of their tails and toothless beaks at the front of their faces. The most intriguing aspect of this huge creature for anyone who endeavors to study it is the sheer quantity of armor covering it. It is known that some species even had armor on their eyelids! Aside from their tail clubs, beaks and armored shells the Ankylosaurus is a particularly interesting species of dinosaur to study due to its sheer size. The Ankylosaurus was the largest known Ankylosaurid, or armored dinosaur and it amazes paleontologists today that such a huge herbivore was able to sustain itself on plant life alone. The Ankylosaurus physiological appearance also features many other interesting aspects which set it apart from other dinosaurs of the late Cretaceous period. One of these aspects is the wide body shape which hung so low to the ground, with hind limbs that were longer than forelimbs the Ankylosaurus also had an arched back which gave the dinosaur its name (ankulos meaning curved and sauros meaning lizard.) The Ankylosaurus also had a long and narrow skull which was not uncommon for late Cretaceous herbivores, its triangular shape made it much wider than it was long and the beak at the end of the mouth allowed for stripping of leaves. Within the Ankylosaurus mouth were small teeth which each had grooves within them and are thought to be suitable for cropping leaves but certainly not for grinding them. Due to the fact that the Ankylosaurus is missing the teeth needed to aid in grinding food for digestion it is believed that the digestive system of this large armored dinosaur was more complex and perhaps even contained a “fermentation chamber” to help break down plant matter for digestion. As a result of the presence of such a chamber it is likely that this dinosaur produced quite a bit of gas as is often seen in any fermentation process! 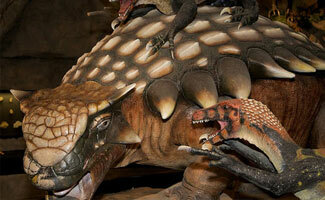 The most commonly referred to feature of the Ankylosaurus is, indeed, its large armored plates. The plates for which the Ankylosaurus has become so well known are actually made from plates and knobs of bone which are embedded in the Ankylosaurus’ skin. These knobs of bone give the Ankylosaurus an armored and bumpy appearance much like that of an armadillo and there is a reason that we are reminded of an armadillo when looking at this dinosaur – the armadillo has similar bone knobs and plates embedded in its skin! These plates and knobs can also be found in some lizards and crocodiles skin these days as well. In the Ankylosaurus it is believed that the bony plates were covered with a layer of keratin which is a fibrous protein based material which is the key element in human hair and nails. In the Ankylosaurus there is no standard size or shape for the bony plates and knobs and so they varied in size and shape from individual to individual. While the size and shape of plates and knobs varied, however, the plates were always arranged in horizontal rows down the Ankylosaurus’ neck and back and hips. Where plates ended smaller protrusions of bone protected the unprotected areas of the dinosaurs back. It is currently unknown as to whether the Ankylosaurus actually had armor plating on its four limbs or on the back of its tail however and interestingly enough the armored plates that it did have along its back were much smoother than paleontologists expected. It is known that the Ankylosaurus had spikes along the side of its tail as well as particularly strong scales on the top of its skull so these areas did not go completely unprotected. For additional skull protection it is known that the Ankylosaurus featured four horns on the sides of its skull which served to protect the head from injury due to the lack of the much thicker armored plates. The Ankylosaurus did not just have armored plates and bony knobs to protect it, however, and one of the other most recognized aspects of this heavily armored herbivore is its large club like tail. The Ankylosaurus tail was certainly not as flexible as some other dinosaur tails due to the last few vertebrae being fused with large bony protrusions which form the well known club tail shape. In order to support such a heavy club at the end of its tail though, the Ankylosaurus’ last seven tail vertebrae were interlocked and formed a stiff rod which was able to support such large bony protuberances. It is believed, from the analysis of fossilized Ankylosaurus tails that their clubs were most likely used as defensive weapons. The Ankylosaurus is thought to have been able to swing its large club tail by utilizing large tendons which connected the last interlocking vertebrae on the tail. By swinging its club tail with such force the Ankylosaurus would have been able to inflict extreme damage on any potential predator. A study conducted in 2009 showed that the huge tail and the bony knobs on the end of the tail could easily have broken bones in most predators of the Ankylosaurus. At one time paleontologists also believed that the bony round tail of the Ankylosaurus served to detract from its head by tricking predators in to believing that the smaller tail knob was in fact the head of the Ankylosaurus. This theory is not so widely accepted anymore and it is believed by most that the club tail of the Ankylosaurus was specifically used as a defensive weapon. During a time when ground life, particularly flowering plants and ferns were diversifying and flourishing at astounding rates the Ankylosaurus seemed to thrive for the most part in the Western United States in Montana and in Canada in Alberta. It is also believed that the Ankylosaurus was present in Bolivia in South America. Unfortunately for paleontologists there have not yet been many discoveries of Ankylosaurus specimens but those that have been located have been in the above listed locations. Where And When Was Ankylosaurus Found? The very first of the Ankylosaurus specimens was found in 1906 by a team led by Barnum Brown, an American paleontologist, to the Hell Creek Formation in Montana. During this expedition, Brown discovered the top of the skull, vertebrae, ribs, part of a shoulder girdle and some armor of the Ankylosaurus. It wasn’t until 1908 that he named the Ankylosaurus (“curved” “lizard”) based on the fusion he saw in the vertebrae of the Ankylosaurus. Brown seemed to have quite a bit of luck locating Ankylosaurus specimens as in 1910 during an expedition to Alberta he recovered another Ankylosaurus specimen, only this time the specimen included a complete skull as well as a tail club which had never been found previously. This specimen also had ribs, limb bones and armor. The two specimens listed above can currently be located in the American Museum of Natural History in New York. In 1947 Charles M. Sternberg discovered the biggest Ankylosaurus skull known to date on an expedition in Alberta; this specimen can now be found at the Canadian Museum of Nature. While only two Ankylosaurus skulls and three partial skeletons have ever been found of the Ankylosaurus one additional sample pertaining to the Ankylosaurus was located in South America. It is near Sucre in Bolivia, South America in 1996 that what is thought to be Ankylosaurus track ways were discovered giving a clue as to how the large herbivore moved. Despite having a large and clumsy looking frame that was weighed down by thick armored bony plates, the Ankylosaurus is believed to have been able to move at a jogging pace. It is particularly difficult to imagine such a large land animal with what we can only imagine as a heavy load of bony armor as well as an arched back, as being able to move at any decent speed! However using the track ways located in Bolivia, South America a Swiss paleontologist: Christian Meyer has been able to ascertain that the Ankylosaurus was indeed able to move at a decent pace. Meyer is able to ascertain the rough maximum speed of the Ankylosaurus by measuring the distance between prints and taking in to consideration the animal’s limb length. It is unlikely that the Ankylosaurus would have made easy prey for any of its contemporary carnivores, at least not from the right side up – were the Ankylosaurus to be flipped over it would be an entirely different story which is perhaps why the Ankylosaurus were able to move quickly as well as defend themselves with their clubbed tails. While the Ankylosaurus was certainly not one of the most intelligent dinosaurs of the late Cretaceous period (measuring around a .5 on the Encephalization Quotient where as the most intelligent of dinosaurs – the Troodontids, measured in at a 5.8!) it was certainly one of the most well protected. Unlike other herbivores of the late Cretaceous period like the duck billed Parasaurolophus who had absolutely no protection from predators other than a herd of its species to hide within, the Ankylosaurus came well prepared for battle. Any carnivore that got a taste for Ankylosaurus would firstly have to fight the thick bony plates and avoid the strong clubbed tail in order to get close enough to attempt to flip this armor plated herbivore over. Once flipped over the Ankylosaurus is much like the armadillo and has a much softer belly, making for a great meal for any predator…that is if they dare to get close enough to try it! It is much more likely that after one try at an Ankylosaurus the predators of the late Cretaceous would have given the large armored herbivore a wide birth and opted instead for less difficult nuts to crack, as it were. When faced with an easy lunch or a more challenging lunch even a small brained dinosaur is going to choose to expend as little energy as possible while obtaining the largest meal possible. While unfortunate for the other, less well protected dinosaurs, the strong armor and club tail of the Ankylosaurus are most likely the reason that this huge animal managed to survive through until the Cretaceous-Tertiary extinction even which destroyed even the largest of dinosaurs. I believe I have a piece of armor to a dinosaur and would like to know how much it’s worth. The lump of bone at the end of its tail worked like a sledgehammer and weighed over 60 pounds. it would take one hit to destroy the leg of a tyrannosaurus, and if a predator tried to flip it over, it would only drive its head into ankylosaurus’ spikes. one nudge would have the predator’s face mauled, not to mention the maximum width of ankylosaurus was 8 meters (or feet) and the height could have been 11.5 feet with all those spikes, the length of ankylosaurus was also disputed though it has mostly been accepted that it ranged from 33-36 feet, with larger, stronger old male bulls placed at a maximum of 40 feet. I’ve always been fascinated by this particular dinosaur. I find it amazing the variety of dinosaurs nature produced, similar to the variety of animals that are alive today. From small, quick dinosaurs, to large flying dinosaurs, dinosaurs with armor, etc. The question begs – as diverse and adaptive as dinos were, they ultimately went extinct. Does the same fate, inevitably, await us? These Ankylosaurs as armored dinosaurs had a special weapon. An Ankylosaurus had a lump of bone like a club at the end of its tail. It could swing this against an attacker.